Fruit is markedly larger (average 1.8 grams), more attractive, with fine flavor. 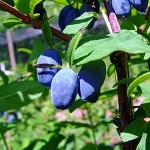 Fruits of all our cultivars are medium in firmness, and are attached to the peduncle firmly enough to prevent pre-harvest drop, but loose enough to pick without tearing the berry flesh. Plants are well adapted to moderate temperate climates as well as colder regions. Flowers are cold-hardy to about 20°F. Plants are more upright in growth habit, reaching 5 feet or more in our 5-year-old plants. Older plants may reach 6 or 7 feet in height with a spread of 4 or 5 feet. Plantings should include more than one variety for pollination. Our cultivars bloom simultaneously (mid-April at our location), although “Kawai” and “Willa” (not available in 2019, but coming soon) begin a few days earlier than the others. All cultivars were developed by Dr. Maxine Thompson, Professor Emeritus from the Department of Horticulture at Oregon State University. They are patented in the US and in Canada, and licensed to us for sale. Plants are sold bareroot, and are available one year old (average height 16”) and two year old (average height 30”). 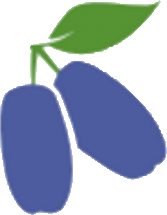 Oval-shaped berries are tart/sweet, medium sized. Very vigorous growers, upright and spreading. At 10 years the plants can reach 7 feet in height with a spread of 5 ½ feet. Mid-season bloomer (mid-April in Willamette Valley). 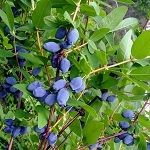 Current availability: One-year and two-year plants..
Large, oval berries are tart/sweet, on very vigorous bushes that are somewhat more open than other cultivars. Mid-season bloomer. Current availability: One-year and two-year plants. 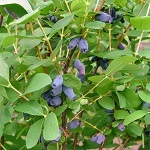 Cylindrical, medium-large berries have a slightly milder flavor than other cultivars, on moderately vigorous plants that have a more spreading shape. A 7-year-old bush is 5 feet tall x 5 feet wide. Mid-season bloomer. 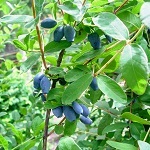 Berries are large and elliptical, some with rolled edges at the tips, giving them a jug-shape. They have good flavor and yield. Bushes are very vigorous, upright-spreading, and somewhat open. Mid-season bloomer. 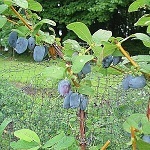 Oval, medium-large berries are tart/sweet, on moderately vigorous plants with an upright-spreading shape. Slightly later than our other varieties to bloom and reach harvest, but will work with any of the mid-season varieties as pollinators. We are propagating two earlier varieties, "Kawai" and "Willa", for sale in future years.